The Canon S-750 excels at fast and reliable prints. There'll come a time when your Canon S750 will run dry of printer ink, and then you'll soon find that ordering Canon S750 ink is normally quite expensive. Fortunately you don't need to bother about coughing up the high prices you'll discover on the main street because here at Cartridge Save you can order all the Canon S 750 cartridges you will want at very competitive prices. Spend less money on your ink by purchasing online at Cartridge Save! Don't pay high prices on a S-750 original cartridge or S750 compatible ink in the main street when it's easy to save a fistful of cash ordering online with Cartridge Save. Enjoy full confidence when purchasing S750 ink cartridges from us because every one is guaranteed by a hassle-free money back guarantee. Keep in mind that each purchase comes with free delivery, generally arriving on your doorstep the very next business day! Designed for low volume office and home use, the Canon S750 is an ideal tool for printing high quality text, graphics and photos. It offers respectable print speeds that are fast enough to meet the needs of a small office. The Canon Bubble Jet S750 prints on standard-size papers (no larger than A4) and offers borderless printing capabilities, which makes it a reliable personal photo printer. The Canon S750 printer, however, does not come to par with photo-centric printers in terms of photo quality. Maximum colour resolution reaches 2400x1200 dpi, which is still acceptable, even with today's stream of 4800x1200 dpi-resolution printers. 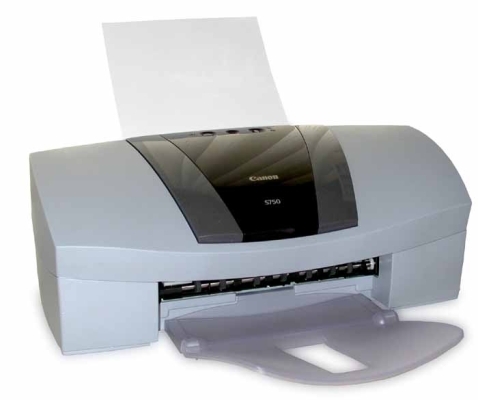 A desktop-size printer, the Canon Bubble Jet S750 inkjet printer measures about 17x11x7 inches. The Canon S-750 colour bubble jet has a USB connector and a parallel port for hooking up to Windows and Mac computers. The paper trays can be a bit flimsy, although this won't be much of an issue if the Canon S750 stays stationary. The Canon S750 colour printer not only boasts high-resolution outputs but also offers reliable print speeds of up to 13 ppm in colour and 20 ppm in black and white. These numbers are among the highest in this class of printers. Borderless 4x6 –inch pictures come out in less than 50 seconds. Cartridges yield as many as 480 black pages, although the colour tanks for the S750 can only produce 280 pages, depending on the density. While the Canon S750 inkjet printer is highly praised for its performance, office users wish that the device had networking capabilities for easy sharing. Quality in photo prints is not overly impressive although the speed of the Canon S750 certainly is.